You are here: Home / Health / Ten 30-day Challenge Ideas for Quitting Sugar Addiction for Good. Ten 30-day Challenge Ideas for Quitting Sugar Addiction for Good. 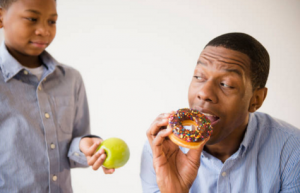 (ThyBlackMan.com) Quitting sugar addiction is possible, but it requires an insane amount of willpower. Understanding the importance of sugar-free diet, nutritional information, and list of ingredients can help you make better choices. If you are ready to take a 30-day sugar-free challenge, here are ten ideas for you. You’re planning to neutralize your sweet tooth and it won’t be easy if you can still find the most common culprit in your kitchen. Start eliminating food items that come with added sugar. It won’t be easy, especially if you rely too much on processed food because most of them contain sugar. Don’t buy such things, don’t bring them home the next time you go out. Read about the food items you regularly eat and if you find the culprit on your plate, eliminate. This is tough but it’s worth it. For some people quitting sugar addiction suddenly is not right because cravings are going to hit you. These cravings will encourage you to choose the reward path and withdrawal symptoms will force you to eat whatever you want. Pushing yourself beyond the limits of your mindset will take you to a point where you’ll feel frustrated. Instead of using shame as a motivator, find substitutes. Luckily it’s 2019 and there are many healthy options available that can stimulate your tastebuds without making you feel guilty. Try to replace the unwanted food items with healthy substitutes and then move on to a completely healthy diet. Have you tried mindful eating? Even if you don’t have a lot of time, set some rules and feel the taste of the food. For instance, you have bought a pack of your favorite chocolates. Now when you open the pack, just eat one and let it melt slowly in your mouth. Feel the taste and let it last as long as possible. This will make you feel full naturally and you will eat less sugar. All you have to do is to just sit down and enjoy the taste without distractions. Your body will soon trigger the need to stop as it will feel that it has had enough. Be creative and set rules which you can easily follow for the next 30 days. Quitting sugar addiction is easy. Chances are, by this point you have almost reduced your dependence on sugar and probably lost weight. Now the next step is to eliminate carbs because they also act like sugar. White pasta, white bread, certain dried fruits including raisins and dates should no longer be the part of your diet. For the limit diet, you can consider high glycemic fruits such as mangoes, grapes, watermelon, and cherries. You can also eat dark chocolate, cheese, and yogurt, but start reducing them one by one. You should limit them not only in the quantity but also in the way you eat them. Just like how you find substitutes as mentioned in point number 2, you can find better alternatives to these things. Your body will go through sugar withdrawal and you have to be strong. This phase will pass after a week or two and you’ll feel a lot better. To hack your cravings and to maintain a healthy and fit body, you need essential nutrients. By eliminating your favorite food items from your grocery list, you prepare your body for a different type of food. So, once you are away from carbs and sugar, it’s time to buy some quality protein-rich food, fats, and veggies. Almost all types of vegetables are good if you are quitting sugar addiction. Prepare a list of low-carb veggies and nutrient-dense food items. When you do something that requires dedication and a long process, for example, quitting sugar addiction in this case, recording your progress and every new thing you learn will be helpful. Take a diary and pen and write your goal on the pages. You can reverse number the pages so that you can see how close you are to achieving your goal. It has a psychological effect. Write about your experience every day and the changes you observed in your body, thoughts, and overall health. Also write about the rough days, cravings and how you tackle them. Withdrawal is not going to be easy, but when you will look back, you will feel better. Quitting sugar addiction is one of your top priorities and the thought of not eating sugar for the next 30 days sounds intimidating. It’s hard but eliminating sugar all at once is the best way. Our brain accepts patterns easily, especially when you are following a yes or no rule. It’s easier for your brain to understand and follow these patterns and as a result, you stay committed to the rule. Giving multiple choices to your brain causes confusion because when you allow yourself to have just one candy or just one bite of your favorite cake, you are breaking that pattern. Saying no to sugar at social gatherings becomes easier when you strictly follow a no-sugar diet plan. Quitting sugar is not easy because a wide range of processed food, 74% of them, contain hidden sugar. Companies often hide this fact by putting sugar content as “zero” on their product label and they cleverly add the * sign which often means no white sugar added to the product. Learn how to identify ingredients that contain sugar as companies hide sugar in their products by calling it by different names. Agave nectar, buttered syrup, glucose solids, maple syrup are some of the different names for sugar. You want to quit sugar in 30 days which means no sugar for 4 weeks. Just after two weeks, you will find that cravings are almost gone. Just keep in mind that during this period of time, you will experience all the symptoms of withdrawal and you’ll feel frustrated. You may even get to the point where you will start hating food, people, and even the smallest things. No matter what happens, don’t cheat because that’s the only way you can quit sugar completely. If you follow a cheat day advice or set up rewards for achieving short-term goals, you will reset the entire process and you’ll lose all the hard work you’ve been doing. As mentioned above, companies are using different names for sugar, you need to be more careful. Food labels can seem complex to read and understand, but knowing how to read labels will help you make sense of the ingredients and nutritional information. For words or numbers that you don’t find easy to understand, take help of reliable sources on the internet. You can also find websites that tell you the real meaning of the nutritional value and all the food additives with their ingredients and safety ratings.